Classy one-man show. The website for the Toshiba Satellite P855-107 states the notebook is a “Powerful and attractive multimedia entertainment” device. This claim arouses our curiosity and makes us wonder if this is an empty promise or if Toshiba can truly deliver on its claim. In this review, we will find out. 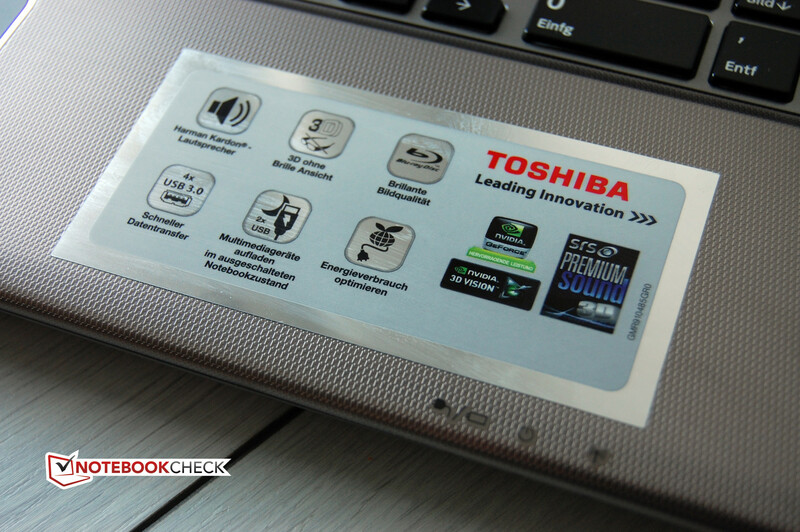 The Toshiba Satellite series of notebooks has been a bestseller for years. This is not surprising as the devices are marked as “everyday notebooks” with “everything one might expect from a notebook” yet at “an especially low price”, according to the manufacturer. This claim suggests that the notebook series is a not only a jack-of-all-trades, but rather a master-of-all-trades at a super bargain price. While this marketing lingo may seem a bit over the top, we can hardly reproach Toshiba for using such flowery language as many other manufacturers do as well. The purpose of this review is to separate mere marketing slogans from actual facts. A large variety of devices is available under the Satellite branding. Our test device is the Satellite P855-107 and is one of the higher-end, better equipped models. This configuration was originally priced at 1449 Euro (~ $1760) but has already been reduced to a price of 1299 Euro (~ $1570). By comparison, the lowest Satellite model costs approximately 449 Euro (~ $549). This price difference is due to the fact that the Satellite P855-107 offers an excellent configuration centered around the latest Intel Ivy Bridge Core i7-3610QM quad-core processor. 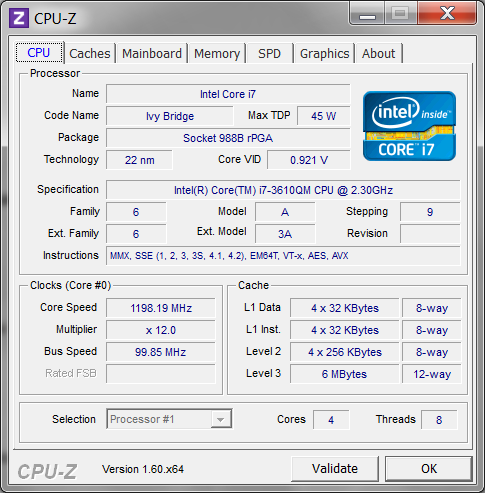 This CPU has a base 2.3 GHz clock and a Turbo Boosted maximum speed of up to 3.3 GHz. This should provide the multimedia notebook with more than sufficient processing power. The CPU is paired with a 15.6-inch Full HD 1920x1080 display that supports Nvidia 3D Vision technology, allowing the user to view 3D content without active shutter glasses. This combination makes the Satellite P855-107 sound impressive. 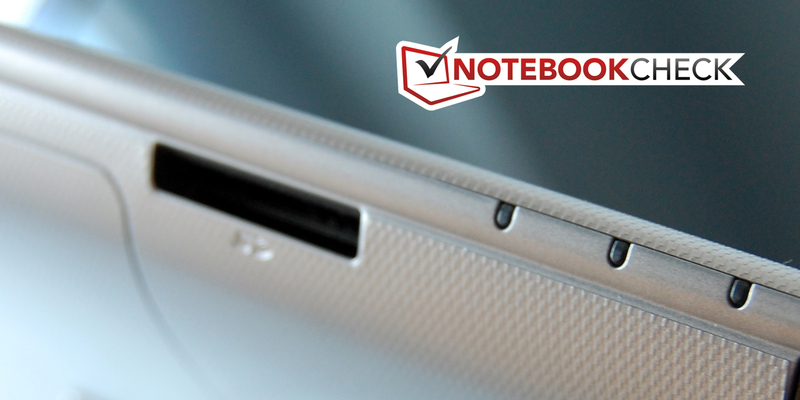 In this review, we determine if the notebook can fulfill Toshiba’s rather enthusiastic claims. 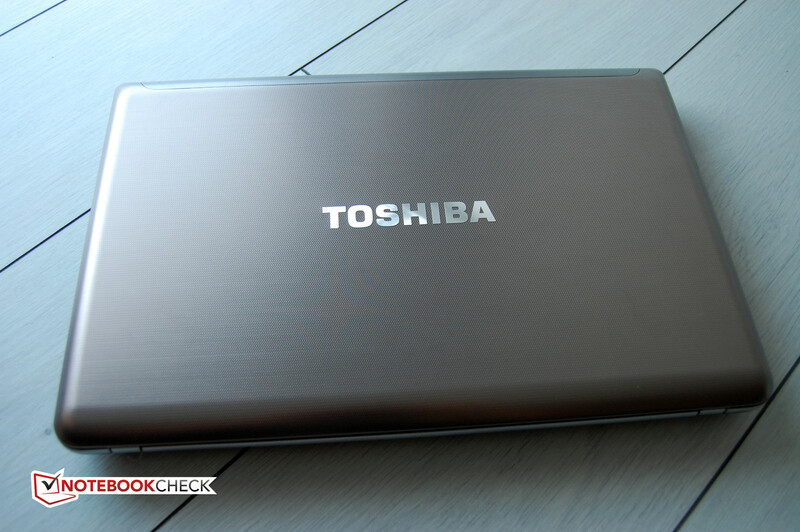 While many multimedia laptops that offer a good performance-to-price ratio are delivered in cases with unsatisfactory workmanship and designs, this is not the case for the Toshiba Satellite P855-107. On the contrary, the full-body aluminum case is excellent, with even gaps and a high-end feel. The surface’s slightly wavy texture also gives the device a rather professional touch and it does not attract dust or fingerprints as some other devices might. Even the color benefits from the texture as the surface appears titanium despite being labeled as “silver” by the manufacturer. The case has a 3.35-centimeter (1.32-inch) maximum height at the rear of the unit and a little less than 3 centimeters (1.18 inches) at the front. While the device’s overall 3.0 kilogram (6.6 pound) weight makes the device fairly portable, the heavy 640-gram (1.41 pound) power supply is, by itself, heavier than some 10-inch tablets. We also have to critique the very thin display lid which visibly dents under selective pressure from the top and is also prone to twisting when open. Both hinges could also be a bit bigger and stronger. While the screen remains firmly in position, it obviously teeters. 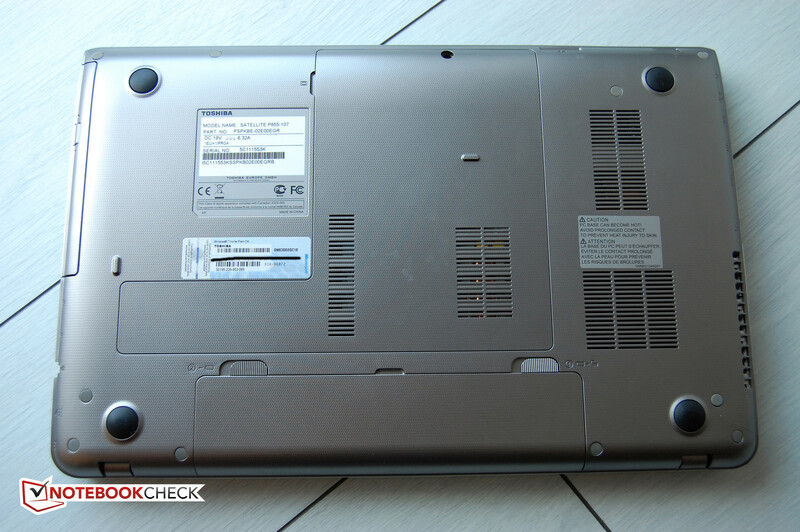 Overall, the Toshiba P855-107 has good workmanship and the underside maintenance cover and battery give no reason for complaint. In order to be an everyday, all-purpose notebook, a multimedia device must first and foremost have complete connectivity. If it is further designed to be a desktop replacement, all the important interfaces should preferably be positioned ergonomically and allow access without creating a tangled mess. Before we discuss the ergonomics and practicality of interface layout, we first consider overall connectivity. The four USB 3.0 ports leave no room for complaint as they should suffice in virtually all scenarios, especially considering the USB 3.0 standard is fast enough for regular data backups and connecting high-capacity external hard disks. The left and right side each house two ports, a distribution that allows for flexibility. However, the ports on the right side are located toward the case’s front and a wired mouse connected to these ports could get in the way of other cables. USB flash drives at the front are also more likely to be damaged from user movement than when connected to ports found farther toward the rear. Monitors and projectors can be connected using the built-in VGA and HDMI for analog and digital transmission respectively. The latter also provides digital audio from sources such as Blu-Ray movies. The Gigabit LAN port and two 3.5 mm audio jacks are essential and obligatory for a laptop of this size. The Satellite P855-107 also features an SD and MMC card reader capable of supporting the latest SDHC and SDXC cards up to 64 GB in size. The rear is free of interfaces. 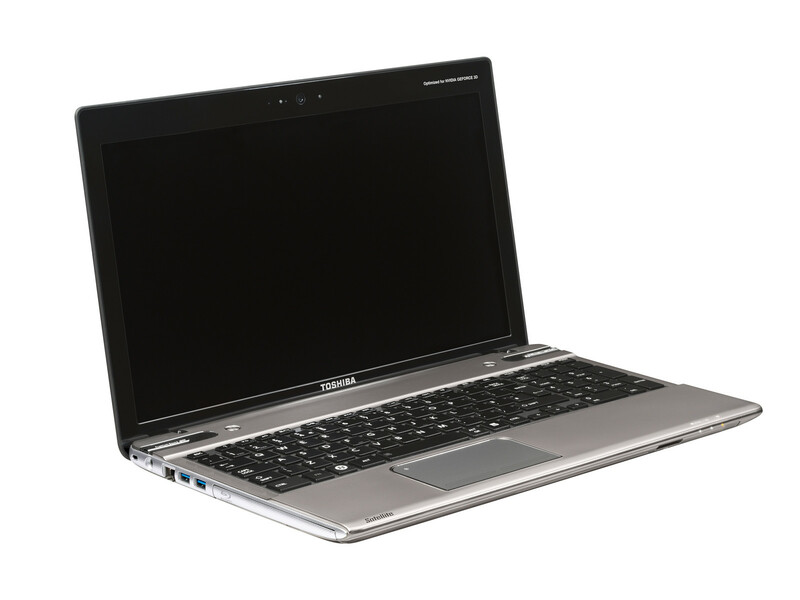 The Toshiba Satellite P855-107 offers a higher communication standard than many other notebooks. The device uses the Realtek Gigabit Ethernet controller for wired networking and the Intel Centrino Wireless-N 2230 for IEEE 802.11b/g/n Wi-Fi and Bluetooth 4.0 connectivity. The latter provides support for the Bluetooth Low Energy (BLE) profile for low power connectivity and high-speed data transfer based on Wi-Fi. This leaves little to be desired except perhaps support for the less-common 802.11a 5-GHz frequency band. Based on the class of this device, we did not expect a built-in 3G / UMTS (Universal Mobile Telecommunications System) module so the lack of one is not a disappointment. The Toshiba Satellite P855-207 comes in an extremely compact retail box that provides barely enough room for the notebook itself and the huge included power supply. Consequently, it is no surprise that the package includes no accessories. There is, however, a comprehensive list of purchasable accessories available on Toshiba’s website. These include USB docking stations, port replicators, laptop cases, and power supply units. The optional 14-inch USB-powered external display is an unusual accessory as it receives both video signal and power from the single USB connection. We consider this to be a clever option for a mobile presentation monitor. In terms of freeware, Toshiba is very generous. Unfortunately, freeware is not something we typically approve of as it is freely available for everyone to download as they see fit, hence the name “freeware”. The included Skype is an example of this and is freely available from the Skype website. As well, the included McAfee Internet Security and Microsoft Office 2010 Starter are programs no one truly needs as the former is time-limited and the latter has limited functionality. On the other hand, the included Nero burning suite is useful for backing up data or creating disc media. The Satellite P855-207 has a maintenance cover on the underside that is held in place by merely one Phillips-head screw. The user should take care when removing the fragile plastic cover as it tends to snag in a few places. Removal of the cover grants easy access to both the system’s working memory and the hard disk. Both of these are easy to upgrade or replace. On the other hand, the fan is inaccessible and Toshiba did not design the notebook for further accessibility of the core components. Toshiba provides a 24-month warranty for the Satellite P855-107. On the website, “compatible services” are also offered. The “One-year, no-matter-what-happens” warranty is available to private users at a cost of 59 Euro (~ $73). As well a “Four-year, international warranty for notebooks” costs 109 Euro (~ $135), a fair price in our opinion. The Data Recovery Service starts at 12 Euro (~ $15) and is also potentially interesting. More information about these and other options can be found on the Toshiba product website. 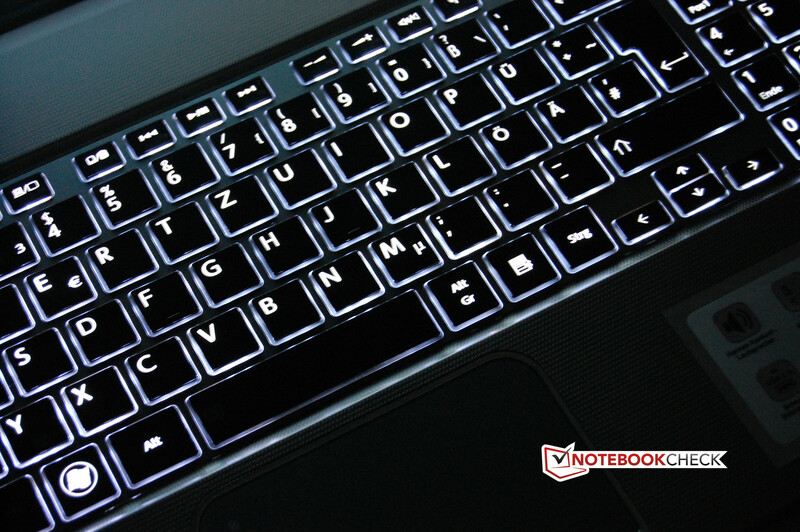 When considering the keyboard of the Toshiba Satellite P855-107, the first thing we noticed was the very smooth, glossy black surface of the individual keys which tended to become annoying in unfavorable lighting. 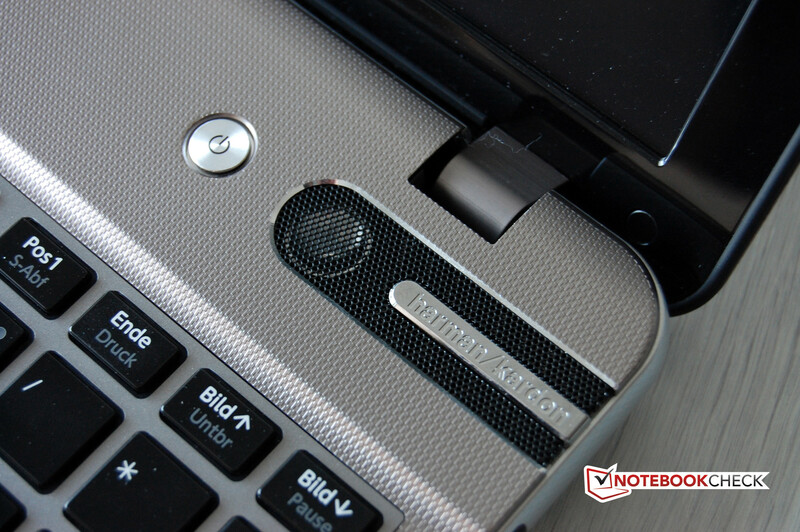 Nonetheless, the keys’ size and 1.5-millimeter (0.06-inch) drop were both complaint-free. The 7-centimeter (2.8-inch) space bar is extremely, and strangely, short. The space bar was reduced in size to allow the arrow keys, which are also very small, to be merged into the lower right area of what would normally be the standard keyboard field. Fast typists will occasionally hit one of the adjacent ALT keys on accident. The twelve Function keys are also smaller than the letter keys. The number pad, on the other hand, pleasantly uses standard-sized keys. The keys generate a high-pitched noise while typing but the sound is not subjectively cheap. In short, the keyboard scores quite well but does have a number of peculiarities. 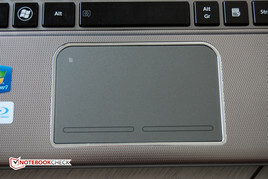 Similar to the keyboard, the touchpad also has a few oddities. 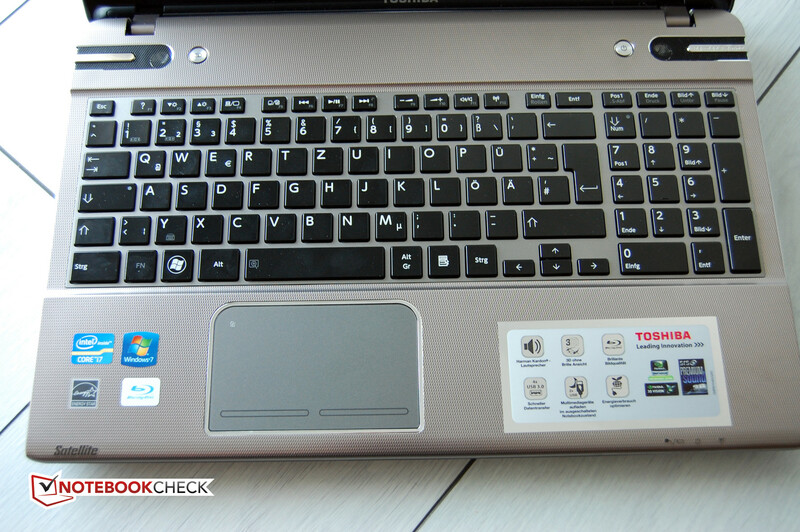 The Toshiba Satellite P855-107 uses the Synaptics ClickPad V1.4 with dimensions 10.0 x 6.4 centimeters (4.0 x 2.6 inches), a size that is not very big but ultimately sufficient. The dark gray, slightly roughened surface provides accurate feedback. This touchpad lacks physical mouse buttons. 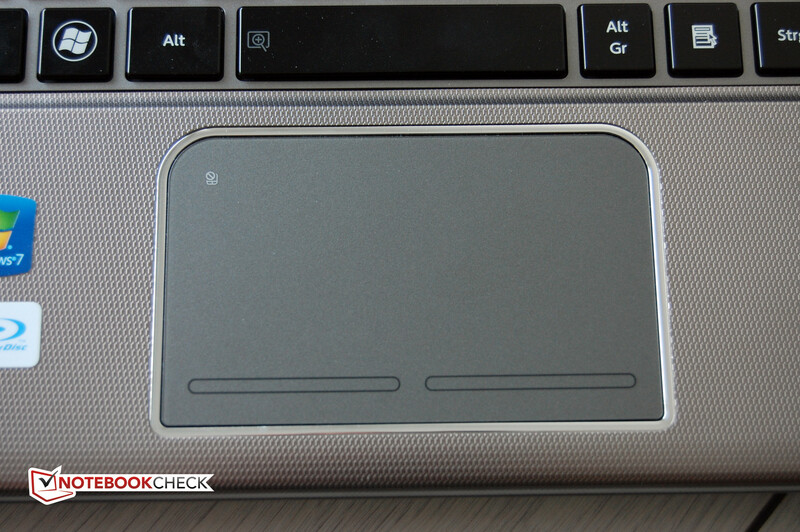 Instead the buttons are integrated into the touchpad’s lower left and lower right and the keys are accordingly outlined on the pad. A symbol found in the upper left corner indicates whether the touchpad is deactivated which can be temporarily accomplished by tapping on the pad twice. Principally, the touchpad works well and responds reliably to inputs and usually provides accurate control. Sometimes, inputs are partially executed after a short delay. While the system was under full load in the system stress test, we were unable to control the notebook using the touchpad. In this case, the mouse pointer only performed actions once every few seconds. On the other hand, the cursor responded fluidly to an external USB mouse. 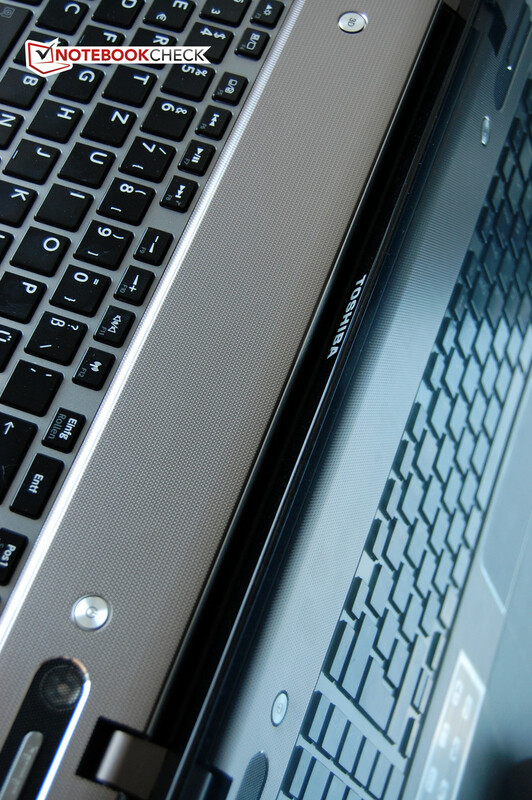 The Toshiba Satellite P855 comes in two flavors. The first of these is the low-end 800 Euro (~ $980) Satellite P855-30H which features a WXGA 1366x768 15.6-inch display. The core components also use less expensive equipment. Our Satellite P855-107, on the other hand, is equipped with a 15.6-inch glare-type 1920x1080 Full HD display that is enclosed by a similarly glossy black bezel. The single largest feature of this TN display is its 3D functionality that does not require active shutter glasses. 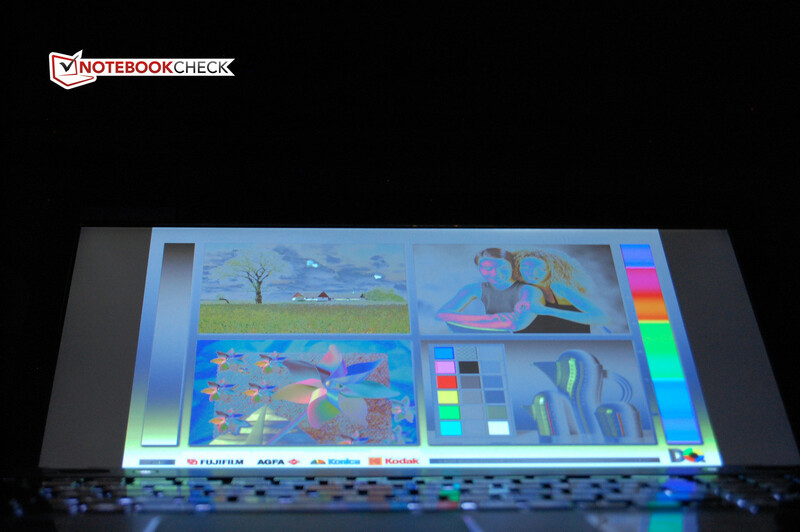 In order to achieve this, the notebook uses an Nvidia graphics card that supports 3D Vision technology, the display panel features a 120 Hz frame rate, and the front face-tracking camera continuously analyzes the user’s eye position. 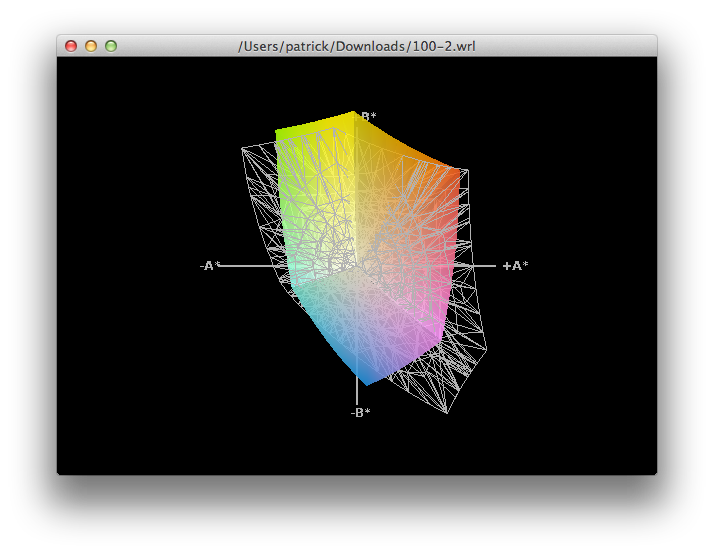 We tested this implementation by using a 3D movie. 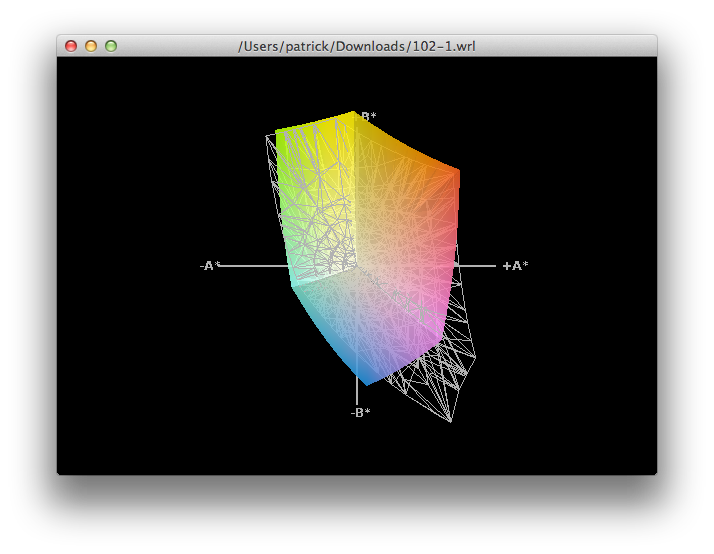 The 3D effect works astonishingly well while sitting directly in front of the notebook. and remaining mostly motionless and focusing one’s view on “nowhere”. After looking away or moving, however, it takes a few seconds for the 3D effect to be restored. We found that 3D rendering is accompanied by a slight blur. In our test lab, we found that the Satellite P855-107’s display does a good job but still exhibits a few shortcomings. For example, brightness could be better as we measured a maximum of 282 cd/m2 and an average of below 260 cd/m2, a level decent for use in very bright rooms. However, sunlight caused the display to devolve into a black hole. Additionally the 80 percent illumination is not particularly homogenous. In specific, the upper right area is too dark when compared to the rest of the screen. The measured deviation of 40 cd/m2 toward the center of the screen is perceptible using the naked eye. However, this impression does not have a negative impact on routine use except perhaps in very dark movie scenes. We measured a good black value of 0.48 cd/m2 which yields a better-than-average contrast ratio of 550:1. The 15.6-inch display has decent image quality. The fairly saturated black allows dark images to appear truly black and not merely dark gray. The high contrast also ensures a visibly good image. Moreover, the colors appear quite natural, although they could still be a bit more vivid. In this regard, the red and blue hues appear a bit pale. We found no issue with the display’s focus. 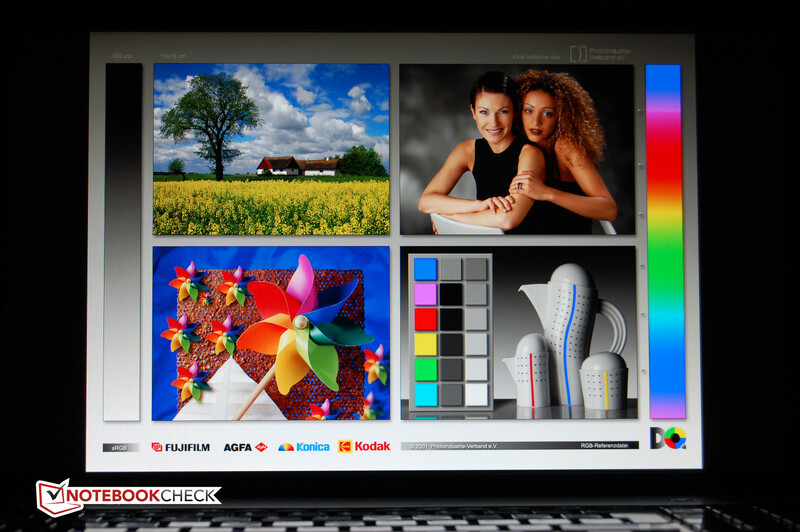 We measured sRGB color space coverage of 82 percent which limits the display’s suitability for professional image processing and editing. Other multimedia devices typically do a better job. 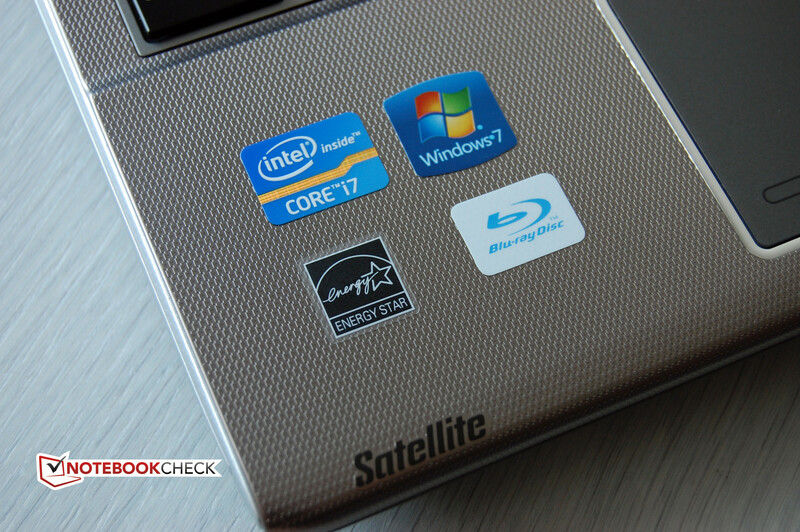 For example, the Acer TravelMate 5760G-2454G50Mnsk achieved an sRGB coverage of 88 percent. With a weight of just under 3 kilograms (6.6 pounds), the Toshiba Satellite P855-107 can be conveniently carried around, for example on the terrace. But in this case, there needs to be an umbrella or parasol .The screen’s brightness combined with the very reflective surface makes the display essentially useless in direct sunlight. However, it remains possible to use the Satellite P855-107 in a shady place. A reoccurring issue with most TN displays is viewing angle stability. While Toshiba cannot pull a metaphorical rabbit out of the hat and the Satellite P855-107’s screen demonstrates the inherent weak points of TN display technology in terms of viewing angles, the P855-107 ultimately does a good job all things considered. Colors remained stable for a significant angle horizontally and only contrast deteriorated. In this case, the display had enough overhead for even better performance. In the vertical axis, the screen was more susceptible to distortion. Looking down at the screen from the top, the display contents faded extremely and the typical TN-based color inversion occurred quickly in the other direction. 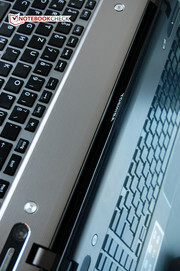 Nonetheless, lap-top use is feasible due to the display lid’s generously wide opening angle. The Toshiba Satellite comes in two configurations. The entry-level P855-30H is available for 799 Euro (~ $980) and features the Intel Core i5-2450M dual-core processor with a 2.5 GHz base clock, 3.1 GHz Turbo Boost clock, and 8 GB of working memory. Our P855-107 test device is more powerful and better equipped, traits that are reflected in the higher 1299 Euro (~ $1599) price. Not only does our test configuration have a higher resolution display, the core components are significantly better. For example, the P855-107 uses a high-performance Intel Core i7-3610QM 2.3 GHz quad-core processor. As long as the processor is capable of handling excess heat, the built-in Turbo Boost 2.0 technology allows the CPU to overclock itself to a maximum single-core speed of 3.3 GHz. With all four cores operating under Turbo Boost, each core can reach a maximum of 3.1 GHz. 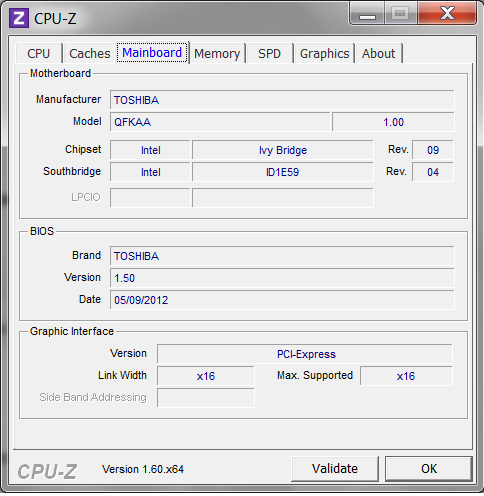 The processor also has a 6 MB Level 3 cache. The processor’s 45-Watt TDP (thermal design power) could hardly be called energy-efficient but is fitting for a multimedia notebook such as the P855-107. The P855-107 is generously equipped with 8 GB DDR3-1600 over two modules. It is possible to upgrade this to a maximum of 16 GB. Remarkably, the memory configuration of the P855-107 is identical to the cheaper P855-30H configuration. While the Satellite P855-107’s installed quad-core CPU is part of the highest Core i7 series, it is slowest amongst quad-core processors. While it cannot be called uncompromisingly high computing power, it should supply more than enough processing power for most scenarios that an ”everyday notebook” might encounter. 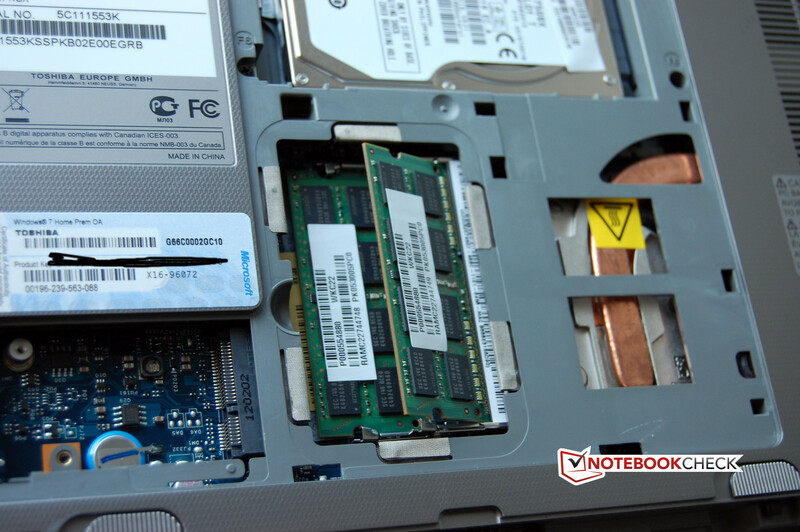 We conducted a battery of tests to determine if the Toshiba Satellite P855-107 is capable of fully exploiting the Intel Core i7-3610QM‘s full potential. In both Cinebench R10 and Cinebench R11.5 benchmark suites, we found that the notebook is capable of taking full advantage of the processor. In both cases, we were able to assess the pure processor performance in both single- and multi-core operation. The first thing we noticed is that Turbo Boost works flawlessly. The core(s) reached maximum clock speeds in the test and maintained it during the entire benchmark process. Moreover, the same score was achieved when operating on battery power. The Toshiba Satellite P855-107 achieved 4438 points in the Cinebench R10 32-bit single-core test and 17354 points when using all four cores in the multi-core test. This scaling factor of 3.91 reflects the slightly higher single-core Turbo Boost speed. By comparison, our test device’s scores fall between devices using the same CPU and laptops using the fastest processor from the previous Sandy Bridge family, the Intel Core i7-2920XM. In the Cinebench R11.5 64-bit test series, the test device achieved a score of 1.36 for single-core operation and 6.2 points in the multi-core test. This 4.6 scaling factor is even better than in the previous test. We typically use both PCMark 7 and PCMark Vantage to benchmark the system and find potential bottlenecks by assessing the system’s overall performance. While it is impossible to fully identify performance-limiting factors due to the sheer number of factors that influence performance, these benchmarks remain a valid method of comparing overall performance to comparable devices. In PCMark Vantage, our test system scored 8408 points, a score within the expected range but ultimately worse than other notebooks based on the Intel Core i7-3610QM. 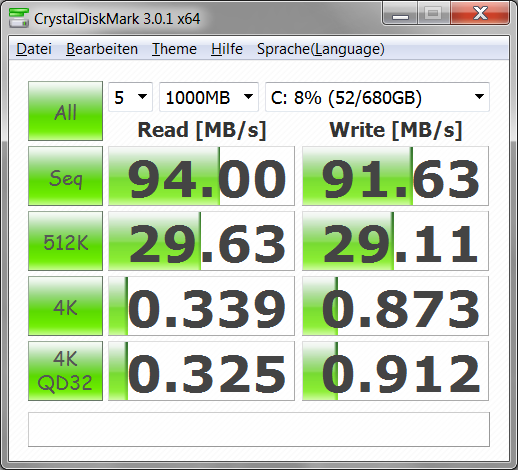 Based on the configuration specifications, the conventional 5400 RPM hard drive is the bottleneck. 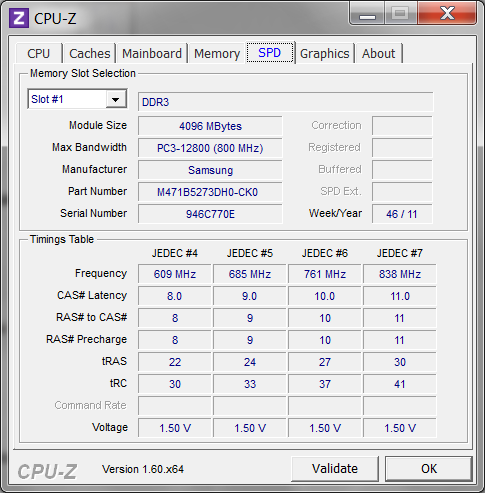 By comparison, the 7200 RPM hard drive in the Asus A95VM-YZ030V (K95V) allowed that system to score 9829 points. The 14757 points scored by the Acer Aspire V3-771G shows exactly how much of an improvement solid state drives provide to overall system performance. The above score shows that overall performance in the notebook is adequate. The processor could provide better scores but is limited by the slow hard disk and the Satellite P855-107 obviously has room for improvement in this category. Nonetheless, the notebook is very fast in routine use. Dealing with larger files, however, sometimes requires a bit more patience than in other devices. 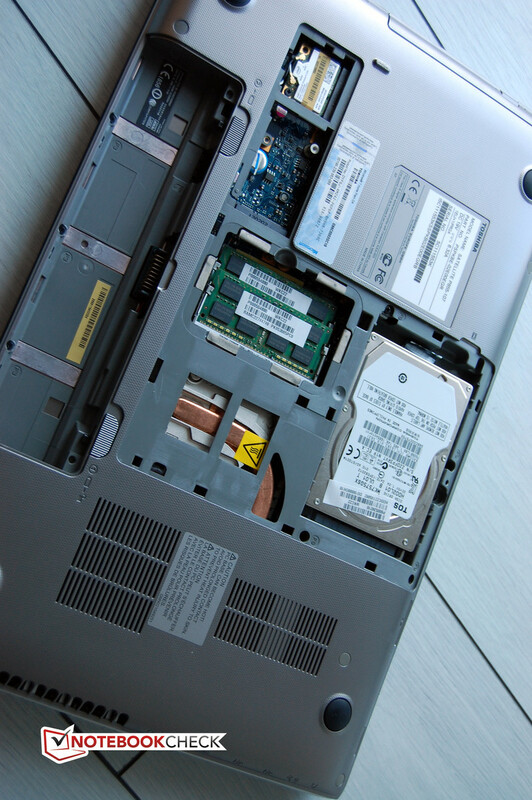 Based on the specification, the hard disk sub-system is not a strong point of the Toshiba Satellite P855-107. 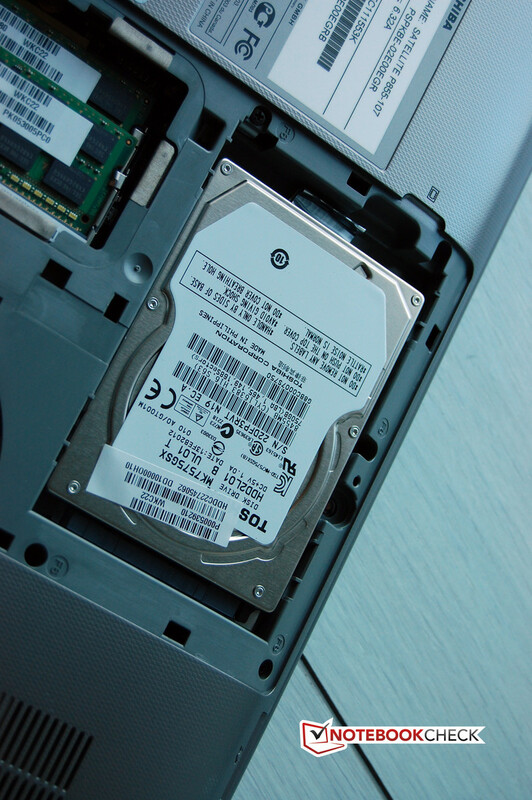 The P855-107 uses the Toshiba 750 GB 5400 RPM MK7575GSX conventional hard disk. 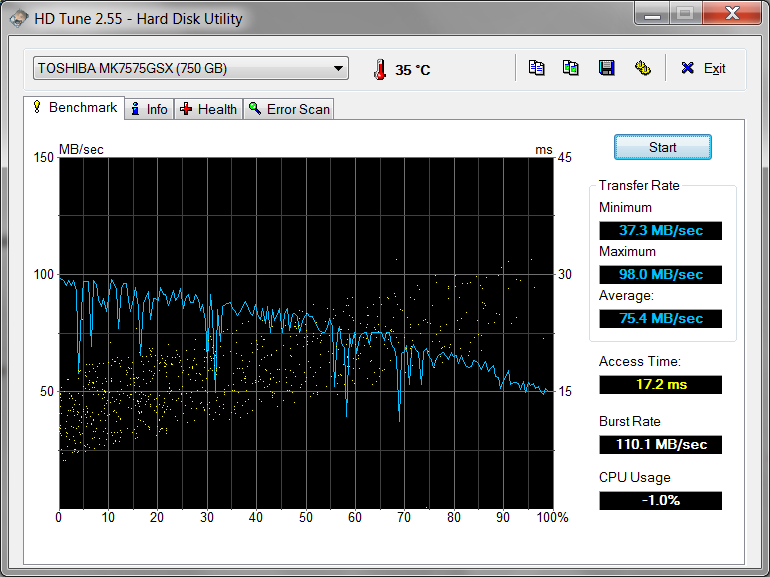 As mentioned in the previous section, the hard disk is not particularly efficient. This was confirmed in HD Tune and CrystalDiskMark. While we were able to record sequential data transfer rates of over 90 MB/s in read and write operations in the latter, we measured an average transfer rate of only 75 MB/s in HD Tune. On the other hand, we observed an acceptable access time of 17.2 milliseconds. 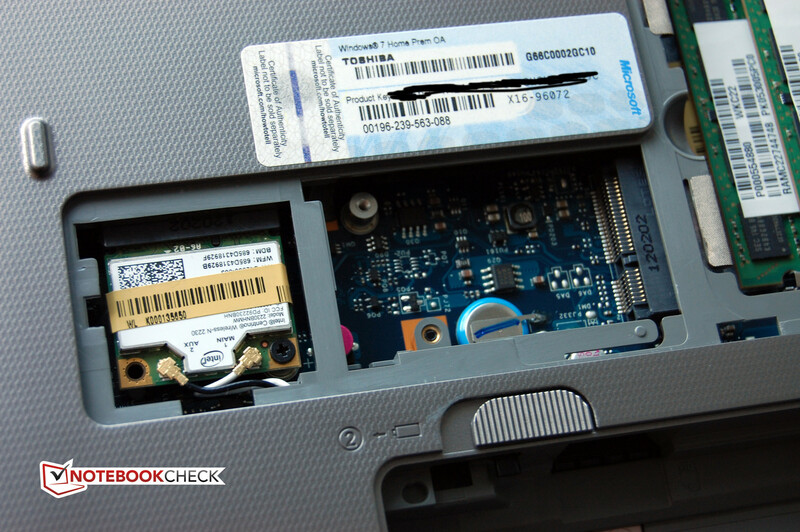 The use of an SSD cache would have made a lot of sense in this Toshiba notebook. The Toshiba Satellite P855-107 uses two graphics cards. The first of these is the processor-integrated Intel HD Graphics 4000 found in Ivy Bridge processors. The second is the dedicated Nvidia GeForce GT 640M. The latter is a mid-range graphics card based on the 28-nanometer Kepler architecture. 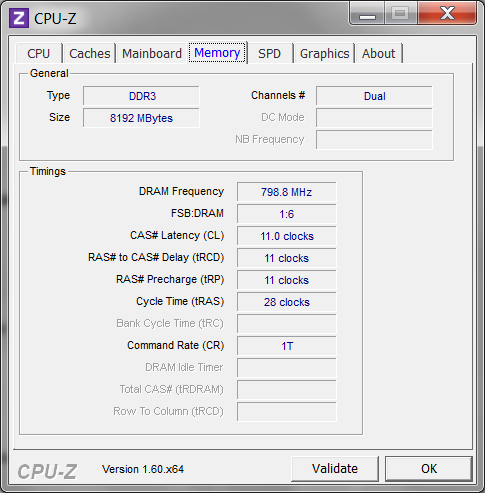 The GT 640M in our test device is supported by 2 GB DDR3 VRAM. While all GT 640M configurations use a 128-bit memory interface, other notebooks might use faster GDDR5 memory. 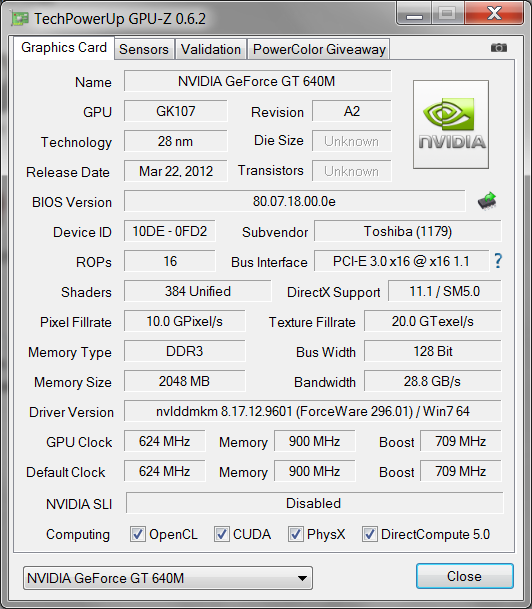 This graphics card provides performance between that of the GeForce GT 555M and GeForce GTX 460M. While the GT 640M supports Nvidia Optimus technology that conserves power by switching graphics cards based on performance requirements, the Toshiba Satellite P855-107 lacks this feature as the use of Nvidia 3D Vision technology precludes the use of Optimus at this time. Therefore, the dedicated graphics card is always enabled in the P855-107 and will likely reduce overall battery life. In performance testing, the Toshiba Satellite P855-107 was unsurprising. The graphical performance fell short of upper limit of notebooks using the same graphics card, likely due to the use of slower DDR3 memory. The Satellite P855-107 scored 7064 points in 3DMark Vantage, a result that is between those of the Dell Inspiron 15R Special Edition (Intel Core i7-3612QM and AMD Radeon HD 7730M) and HP Envy 17 3D (Intel Core i7-2670QM and AMD Radeon HD 7690M XT) and is thus in good company. In 3DMark06 and 3DMark11, the results followed the trend and we observed no abnormalities. Results on battery power were the same as those on AC power. While the Satellite P855-107 is not designed for games, the CPU and GPU configuration left us hopeful that performance gaming might be an option. To determine if this is the case, we played four current games and used our standardized benchmark sequence for assessing gaming performance. We began our test series by using the F1 2011 in-game benchmark. At low settings and an 800x600 resolution, the game was playable at 60 fps but nonetheless considerably below the anticipated result. Other devices with the same graphics card manage up to 80 fps. This trend was continued in higher resolutions and details but F1 2011 was ultimately smooth and playable even at high settings. We also did not observe any irregularities in The Elder Scrolls V: Skyrim. In this game, we were able to achieve the expected results and the game was fully playable on both low and medium settings. In high details, the game came close to the limits of playability and minor jerkiness was observed. Similarly, we attained expected frame rates in Anno 2070 and Risen 2. While Anno 2070 was fairly smooth even in high settings, medium settings were the limit for decent gameplay in Risen 2. As we cannot explain why the performance in F1 2011 fell short of expectation, we did not add this result to our game database as they would skew overall results. The Nvidia GeForce GT 640M’s performance in other games can be found in our extensive gaming benchmark chart. In order to assess the quality of the built-in Nvidia 3D Vision, we played the game Call of Duty: Modern Warfare 3. We found that 3D Vision can only be enabled at Full HD resolution. In our test, we used the lowest settings to achieve viable frame rates. Fraps demonstrated that frame rate in 3D mode is halved compared to 2D mode. The reason for this is simple: the GPU has to calculate two pictures at the same time, one for each eye. The 3D effect was subjectively nice, but the overall gameplay environment suffered from minimum settings. 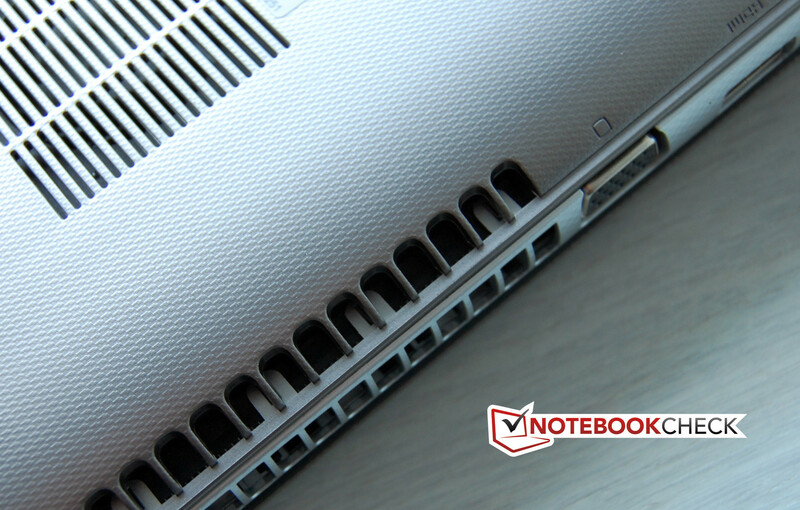 We found the Toshiba Satellite P855-107 to be mostly unobtrusive in terms of system noise, at least as long as it is not placed under full load. While idle, we measured an audible but hardly-disturbing average noise level of 31.6 dB. At times, the noise level reached a maximum of 33.6 dB but the notebook only maintained this level for a very short time. When copying larger amounts of data, the hard disk’s noise became dominant and the overall observed noise level rose to 33.7 dB. The much-noisier optical drive raised the noise level to 39.5 dB during DVD playback and we felt this level could potentially interfere with movie enjoyment, especially in quiet surroundings. Under load, the system fan’s noise level climbed to a noticeable 39.1 dB as the fan reached half-speed. During full load, such as during demanding 3D games, the fan noise increased to 42 dB. Fortunately, the P855-107 benefits from a pleasant, rather consistent fan noise. In the realm of high-performance notebooks, designers are always challenged to find the proper balance between quiet operation and powerful, high-performance components which generate a significant amount of heat. If the components are scaled back, the notebook fails to meet its potential. 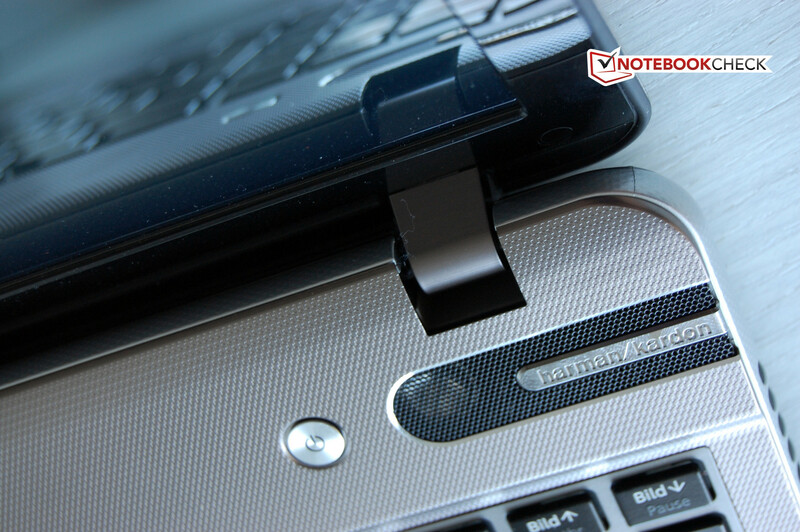 On the other hand, if faster or more fans are added to the notebook, the overall system noise may end up making the device unpleasant to use. As a result, notebook manufacturers are often forced to focus on high-performance or quiet operation, but not both. To test the Satellite P855-107, we measured the system’s temperatures in various scenarios. 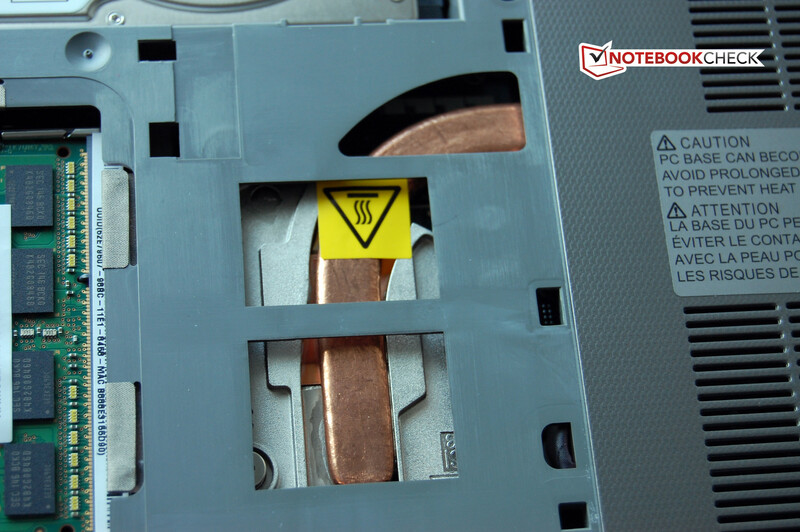 In the first scenario, while the notebook was idle, we found that the P855-107’s cooling system had no problems and was able to keep temperatures under control. We measured a maximum temperature of 33oC (91oF) on the right side of the base unit. The keyboard and wrist rest remained cool and pleasant to use. 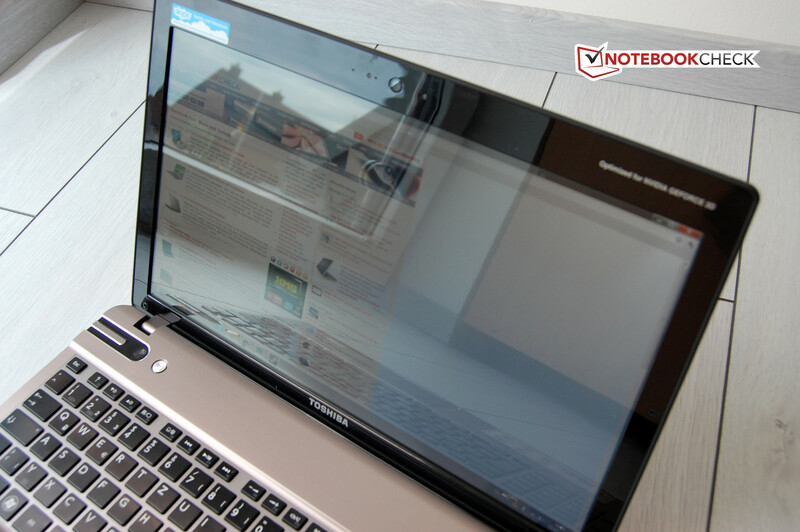 The underside reached a maximum of 34oC (93oF), making the notebook safe for lap-top use. During our Furmark and Prime95 simultaneous stress test, the notebook became considerably hotter. It should be noted that this test is an unrealistic scenario but perfect for pushing a notebook’s cooling system to its limit. For the Satellite P855-107, the stress test overwhelmed the notebook’s cooling system and its core temperatures reached a maximum of 104oC (219oF) after only a few minutes, causing the CPU to throttle below the base clock in order to reduce heat generation. We also measured a maximum temperature of 55pC (131oF) on the base unit. We observed a 1200 MHz CPU clock in this scenario. While this is in itself significant, this throttling is compounded by its effect on 3D performance as well. 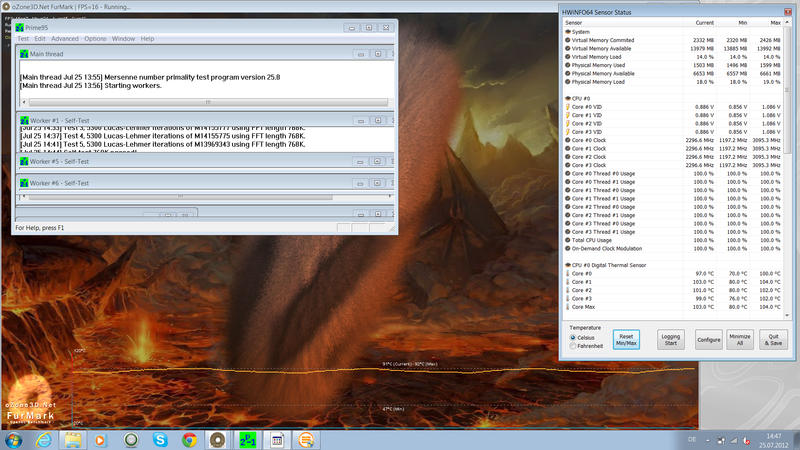 We ran 3DMark06 again after our stress test and recorded a 3.5 percent lower score. This could conceivably be explained by measurement tolerances. However, the 25 percent reduction in CPU performance clearly demonstrates throttling. This is quite concerning but a repeat of the F1 2011 benchmark performed immediately after the stress test did not reveal any performance loss. Nonetheless, our conclusion is that improvement in heat management is needed. (-) The maximum temperature on the upper side is 54.4 °C / 130 F, compared to the average of 36.5 °C / 98 F, ranging from 21.1 to 71 °C for the class Multimedia. (+) In idle usage, the average temperature for the upper side is 29.8 °C / 86 F, compared to the device average of 30.9 °C / 88 F.
(-) The average temperature of the palmrest area of similar devices was 29.1 °C / 84.4 F (-14.4 °C / -25.9 F). Upon opening the Satellite P855-107, we immediately noticed the Harmon-Kardon logo that adorns both speakers, indicating that Toshiba has given some thought to the speaker system for this notebook. The built-in Realtek ALC280Q-GR sound card also features SRS Premium 3D sound. Subjectively, had we not known that the sound from the Satellite P855-107 was coming from a notebook, we might very well believe it had come from a stereo system. Aside from the restrained bass, there were no complaints that might suggest the audio system is based on notebook speakers. The sound was clear, powerful, and more than sufficiently loud. The speakers are definitely suitable for games and movies, and even music can be fully enjoyed as long as it is not classical or opera. The combination of large screen, powerful CPU, and dedicated graphics that cannot be deactivated via Optimus cause us concern regarding the power consumption of this multimedia notebook. Nonetheless, the results while idle were acceptable. Using the Eco Mode, the recommended energy-saving options set by Toshiba, we measured a power consumption range of 12.4 Watts and 17.9 Watts. In routine use, we measured a power consumption of 16 Watts, a moderate consumption level. The situation is completely different under load, particularly when the graphics card is fully loaded. The Satellite P855-107 consumed 66 Watts from the battery in the medium load range and just below 90 Watts when both the CPU and GPU were fully loaded. These consumption levels are no problem for the included 120-Watt power adapter. 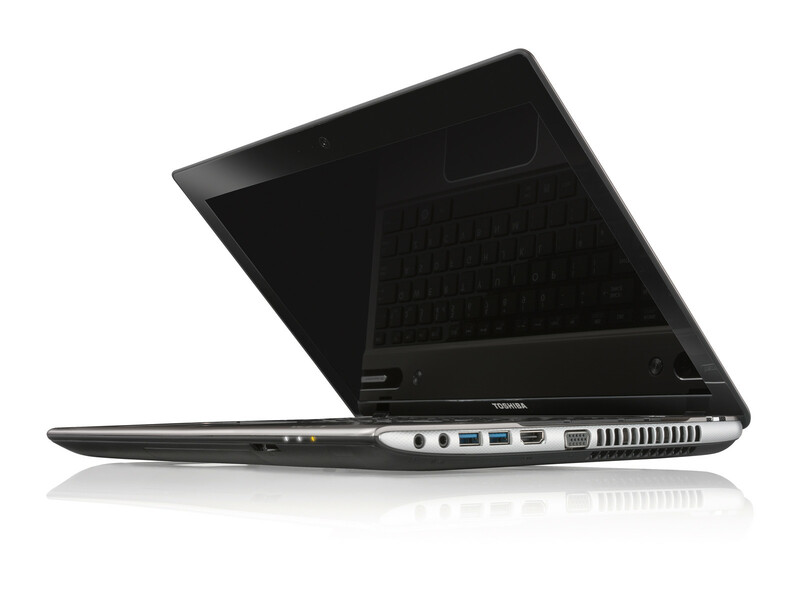 The Fujitsu Lifebook E781 is more energy-efficient but obviously lacks a dedicated graphics card. In light of this, we consider the power consumption of the Toshiba notebook to be absolutely acceptable. 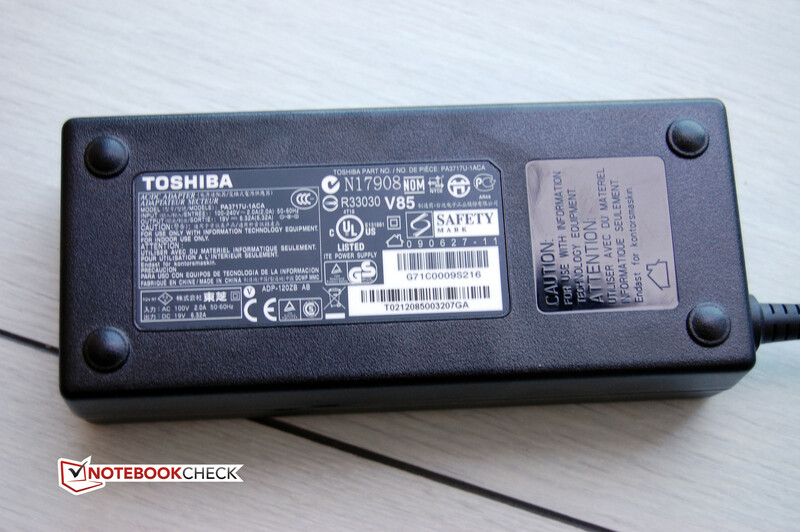 During our power consumption test, we noted that the Toshiba Satellite P855-107 uses a 48-Wh lithium-ion battery. Our initial concern during consumption measurement was that the rather small battery combined with the hefty consumption would result in a shorter runtime. In our battery runtime assessment, our fears were confirmed. 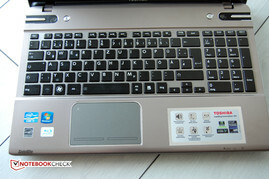 Even under the most ideal conditions, Toshiba advertised the notebook as having a maximum runtime of five and a half hours as measured by Mobile Mark 2007. We used the Battery Eater Pro test suite to determine the maximum and minimum runtimes. In the Reader’s test, using minimum brightness and with wireless communication modules disabled, we measured a poor runtime of 4 hours 27 minutes. In the power-hungry Classic test, used to measure minimum runtimes, the Satellite managed less than an hour. As neither of these tests are significant for everyday use, we used our own Wi-Fi surfing test during which we set the display brightness to 150 cd/m2 and enabled wireless modules. Our test simulates browsing the Internet and the 15.6-inch Satellite lasted almost exactly three hours. 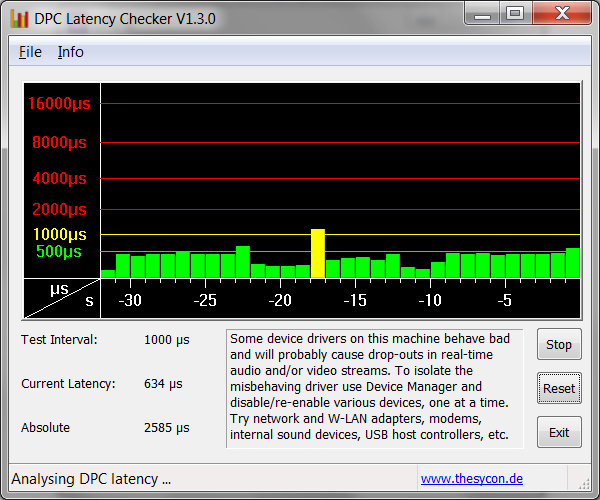 This result rules out the use of the notebook for longer surfing sessions and movie nights while off AC power. While we managed two hours during DVD playback, the sample notebook was unable to play even a standard movie with its 90 minute runtime when playing Blu-Ray. These results are not exemplary for a multimedia device. Overall, battery life proved to be average at best. The Toshiba P855-107 has pros and cons. Fortunately, the pros outweigh the cons. 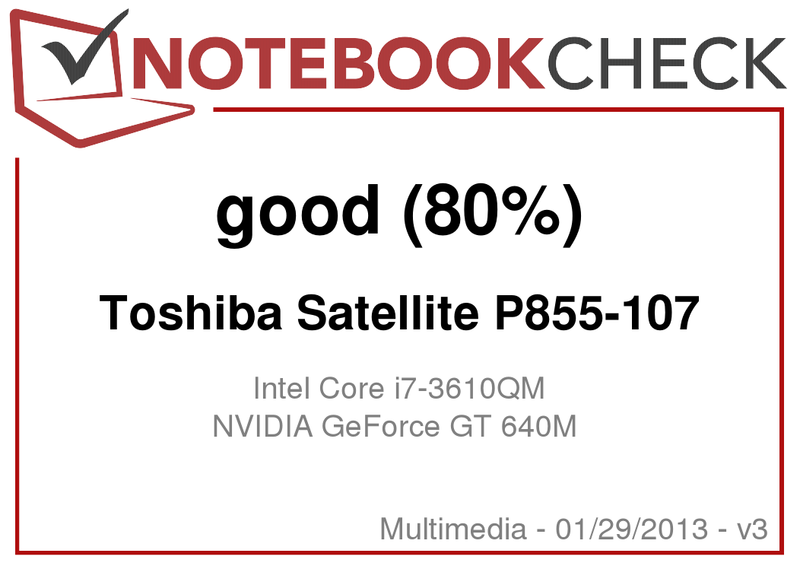 In summary, we found the Toshiba Satellite P855-107 to be mostly positive. 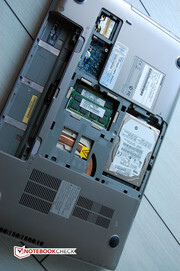 We were satisfied with the 15.6-inch multimedia laptop’s workmanship. The textured surface and choice of materials made a high-end impression. The display lid could have been a bit stiffer though. The hardware is appropriate for the price range and intended role. A state-of-the-art quad-core processor, 8 GB of RAM, and a dedicated mid-range graphics card should prove sufficient for all practical applications. However, the Satellite P855-107 is not a purpose-built gaming machine. The performance was in line with the configuration and all-in-all quite high, but the slow hard disk limits the system’s overall performance noticeably. A small SSD cache would have certainly been helpful in this regard. The keyboard and touchpad made a conflicting impression. While it was possible to type quickly and the keys provided good feedback, we found the glossy surface and the very small keys, namely the arrow keys, space bar, and function keys, to be very annoying. 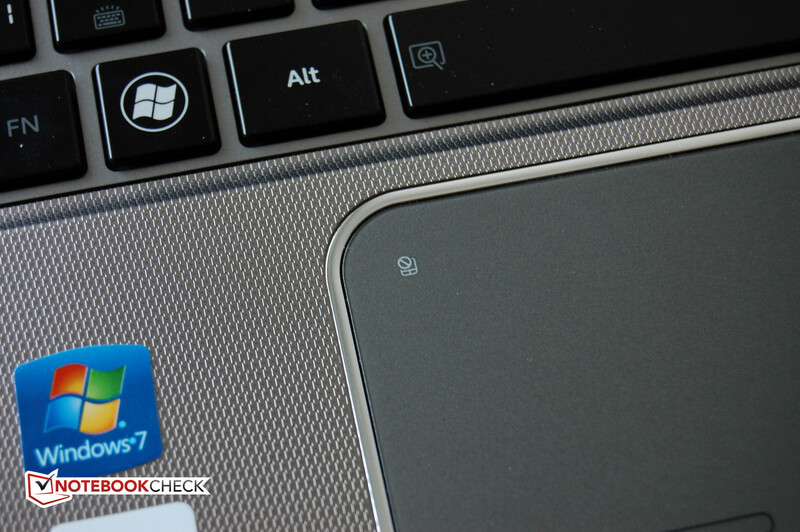 Similarly, the occasionally jerky touchpad that refused to work during full load is a glaring flaw. The display also has its strengths and weaknesses. While its brightness is not outstanding, the black value and corresponding contrast are good, leading to a fairly decent image quality. The reflective glass surface makes outdoor use difficult and the merely moderate viewing angle stability is typical of TN displays, but not disturbing. The greatest features of the display are the Full HD resolution and glasses-free 3D functionality. 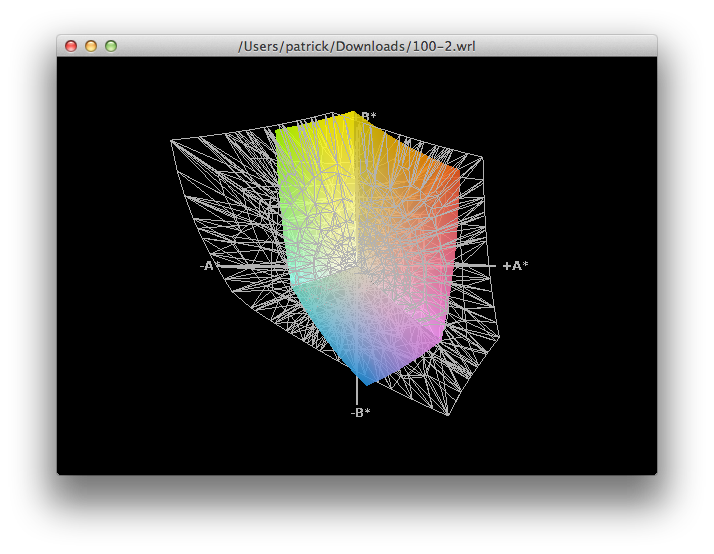 Although not perfect, 3D Vision was fun to use. 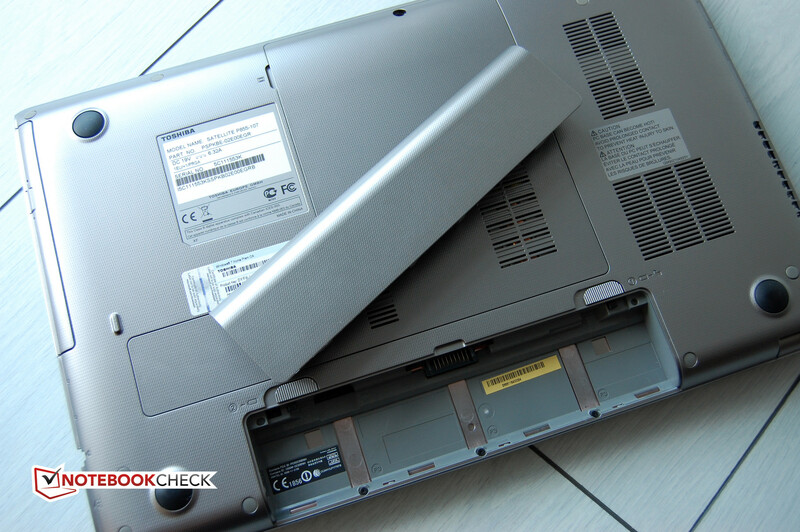 The Toshiba Satellite P855-107 usually demonstrated a pleasant operating noise. Unfortunately, the Blu-Ray drive did not follow suit and its noise was annoying audible. 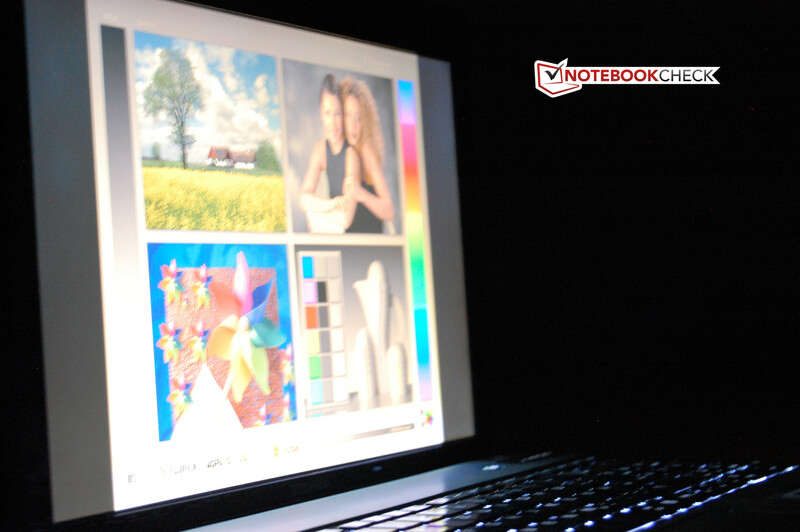 The thermal design is the largest point of criticism for the multimedia notebook. During our stress test, we observed heavy throttling which may or may not be noticeable during routine use. Nonetheless, it does not shed a favorable light on the cooling system and indicates the potential for some degree of throttling during continuous, high load use during extreme gaming in high ambient temperatures. Gamers will also likely have fun with the P855-107. While it is not at the highest-end of performance, most up-to-date games ran smoothly in medium to high settings. Last but not least, the moderate battery life is a weakness as well. 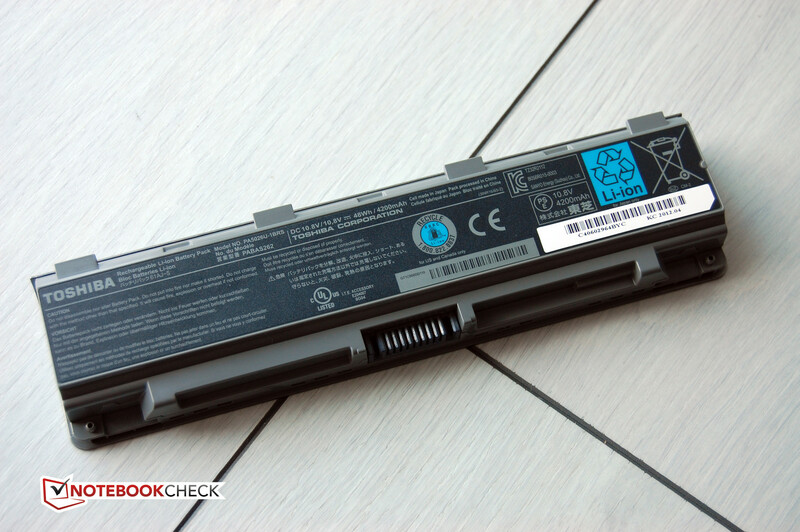 Nonetheless, we can recommend the Toshiba Satellite P855-107. This 15.6-inch device is a good choice for users looking for a high-performance multimedia device that can serve as a home desktop replacement. Even most modern games run flawlessly. The device has small flaws, but then again all notebooks do. However, with a retail price of 1300 Euro (~ $1570), it is not exactly cheap either. The textured surface looks elegant. You can see the heat pipe but not the fan. The maintenance cover is fragile and could break. The SD card slot and status LEDs. The single keys are reflective. The speakers live up to their name. The power button is above the keyboard. The fan's opening is quite big. The battery does not have a high capacity. The notebook works even without the battery. The power supply is a real brick. The high-quality workmanship. The device is also nice to look at. A better cooling system and a quieter Blu-Ray drive would make watching videos even more fun. And of course a bigger battery. The runtime is quite short. Glasses-free 3D is nothing new, but it is still good for surprises. Competition is huge in the field of medium-sized multimedia laptops. Almost every manufacturer has a corresponding device in its range. The Toshiba Satellite P855-107 has to compete with the Dell XPS 15 (L521X), Gigabyte P2542G, Dell Inspiron 15R Special Edition and Asus K55VM-SX064V among others. The new Lenovo Y580 is also a contender.